We’ve all heard about a “glass ceiling”, which describes an invisible barrier that keeps minorities and women from rising to the upper rungs of corporate ladders, regardless of their qualifications or achievements. I’ve observed a different kind of invisible barrier at startup companies, and it applies principally to younger entrepreneurs. I call this barrier a “glass helmet.” It’s similar to a glass ceiling in the sense that it keeps individuals (entrepreneurs) from achieving greater success even if they are capable. Glass helmets differ from glass ceilings, however, in an important respect. Whereas glass ceilings are imposed by others, glass helmets are self-imposed by the entrepreneurs, though they may not even realize it. So what is a “glass helmet”? A glass helmet typically appears when an entrepreneur has limited working experience or has worked previously under another young leader who proselytized his or her particular way of doing things. Lacking exposure to many styles of leadership and the many different ways in which strategies, initiatives, tactics or other goals can be carried out and achieved, entrepreneurs with glass helmets believe there is only one way of doing things: the way they previously learned. They then repeat this prior-learned methodology, not realizing that there may be better or different ways of doing things. Oftentimes, this prior-learned behavior conflicts with the entrepreneur’s own sensibilities, intuition or ideas about how something could be done. But the entrepreneur lacks the experience and confidence to take the alternative. I call this a glass helmet because it’s an invisible barrier around the entrepreneur’s own mind. It prevents the entrepreneur from seeing and acting on many other possibilities lying just beyond the glass helmet. In my career, I've worked under many leaders with different styles and in companies effecting myriad strategies and initiatives at different stages of growth. What I've learned is that there is almost never “one right way” to do something. In terms of leadership style and actions, the most important thing is to be your authentic self. Merely mimicking the behavior of another leader seldom works. In terms of carrying out the company’s goals, strategies and initiatives, there is almost always more than one way to climb a mountain. If you only know one path, then at least realize that there are likely others. Your job, then, is to seek them out. Speak with other leaders, businessmen and entrepreneurs, especially ones who have had more exposure, and don’t be afraid to use your own judgment as well. You’d be surprised at how significant the impact could be. 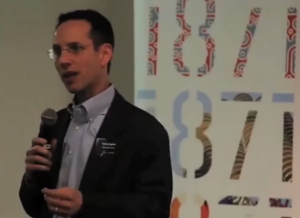 Larry Kaplan has been a CEO JuntoMentor since 2013. He is currently CEO of Impossible Objects, the first composite-based additive manufacturing method for 3D printing that is stronger and faster than conventional technologies. Prior to Impossible Objects, Larry was CEO of Eudora Global and Navteq.